THE Trumpet Vine is number 661. This is a very unusual design and makes up beautifully as you can see by the illustration. If you want the pattern only, order number 661 at 20 cents. Material for a pillow top or one block 13 inches square with pattern included may be ordered as number 661A at 40 cents. Eight and one-third yards of material for the quilt top including the three colors and also white with enough yellow print allowed for binding—together with the Trumpet Vine pattern are number 661B at $2.50. These old-fashioned chintz print calicos are good quality, but we can not guarantee them as fast color. 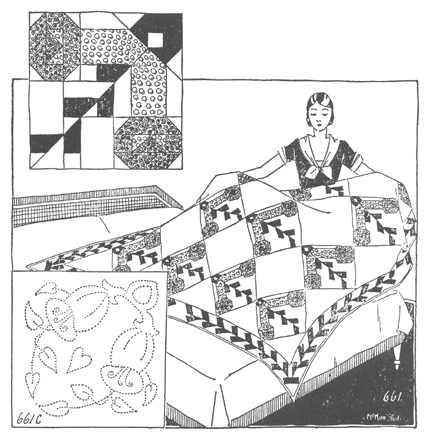 As you will need a quilting pattern to use on the alternate plain white blocks, we have made up a design, 661C at 25 cents, that is exactly the right size to use with this quilt. This design is 12 inches square and comes perforated on durable paper so that it is very simple to mark the design.